Quake / Learn how to make maps for Quake2! Very easy! download Teamviewer version 10 or if there is some other remote desktop software your prefer to use let me know. we can use Discord to chat while I help your learn the keys and make sure your program is setup correctly. 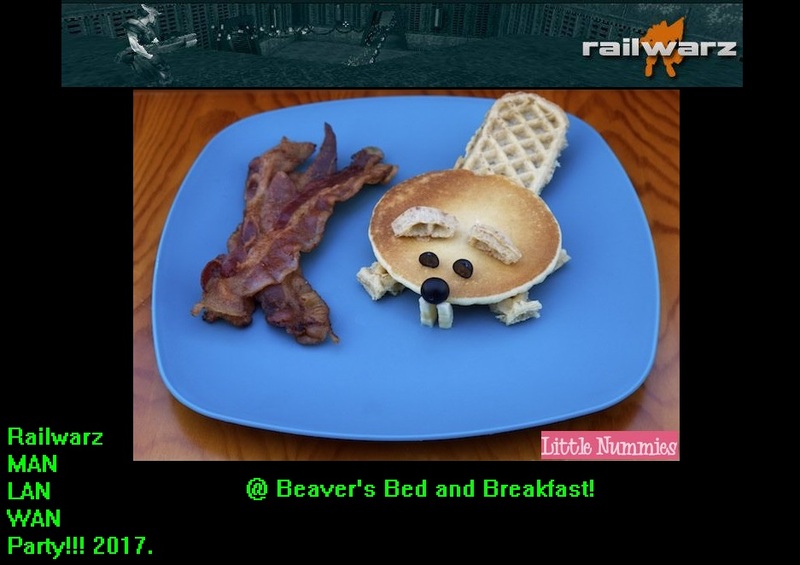 Railwarz / Railwarz Cash Tourney Start Dec 4th 5th 11th and 12th! Both clans will face off twice in the night. Allowing for one map pick for each clan and total of 4 maps per night. I am trying to keep the time management at a short and sweet pace to avoid having games go on late at night. 4 Captains will be needed for the team picks, preferably those who have experience in judging player talents. This System should allow for very balanced teams. So Far we will have 4 clans with the confirmations of people we have. Id like to max out at 6 people per clan allowing for big games if everyone is available or simply the flexibility between no shows, isp issues, or wet farts. If there are any last minute donations to sweeten the prize pot let it be known ASAP, all donations are directly applied to the cash prize and will never be used for any other reason. 1. If you must trash talk, do it with friends who know how to differentiate between fun and disrespect. 2. Not all Players are on the same talent level, any negativity towards players not producing or not playing to your liking will not be tolerated and you will be removed instantly without discussion from the tournament. No one should be Belittled while trying to have friendly fun. 3. No Pay for No shows, If you do not participate in any matches due to no show reason, you will be removed from the cash prize pool and they will simply split it between those who contributed. 5. Minimum match requirement 3vs3 if any team fails to have their players they will forfeit their match. We invite you to utilize Discord Quake Legacy Channels for voice communications for teamwork or simply getting to know the guys you have been playing with for years. L-Fire / L-Fire CTF Sunday Nights! 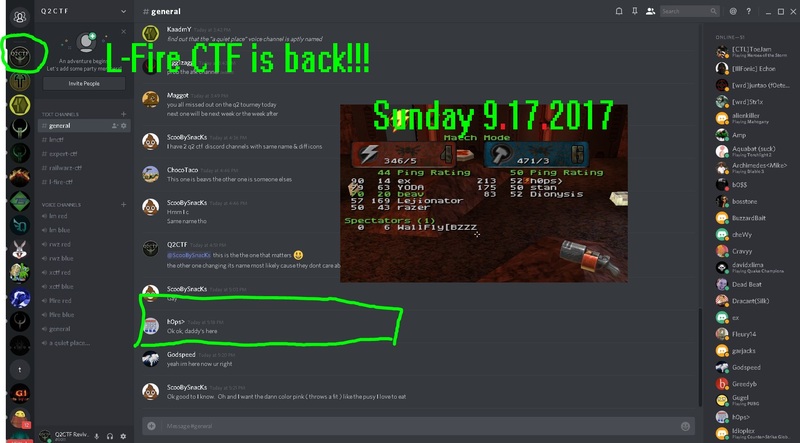 LMCTF / LMCTF is back! Community Events / Railwarz Cash Money 3v3 Tourney Begins October 2017! 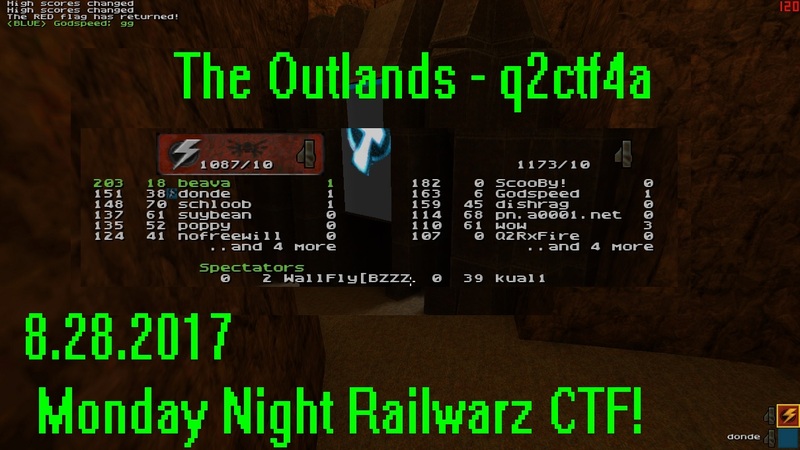 Railwarz Cash Money 3v3 Tourney Begins October 2017! rusty and out of practice? Public Games 7 Nights a week. Games starting early this past week 5 6pm eastern! and lasting till 1am or so most nights! 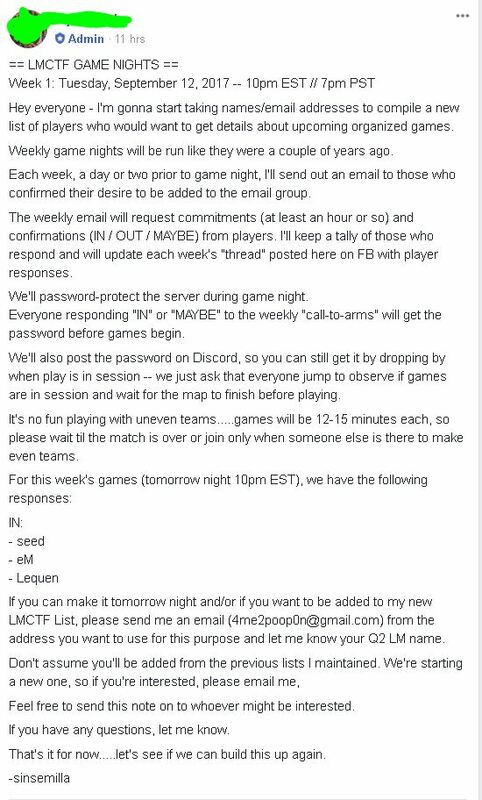 5v5-10v10 games happening for 8 hours a night! Quake / Quake 2 Gloom Mod! Quake / Looking for Quake2 Friends! 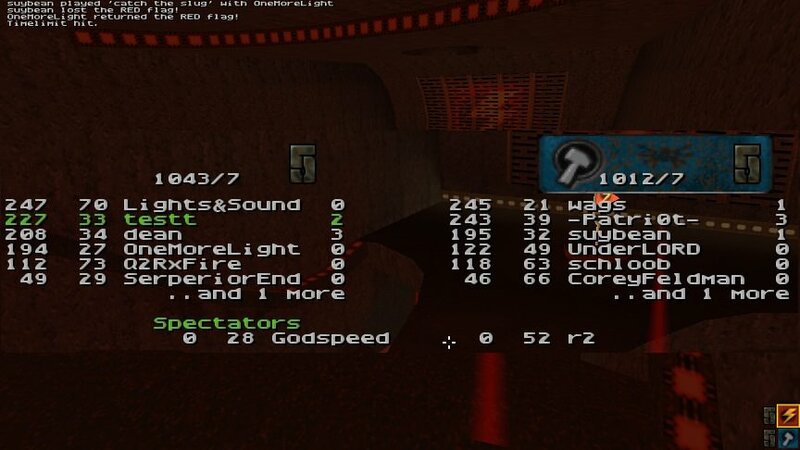 Quetoo is a new open source remake of quake2 the rail only instagib is pretty fun! hook can be voted on and off on the server, theres dm, tdm, ctf, clan arena, check it out! Trouble Shooting / .filelist http download help! trying to use a file list to download some files for ctf ive made it work before in the past but am unsure why it wont work now. 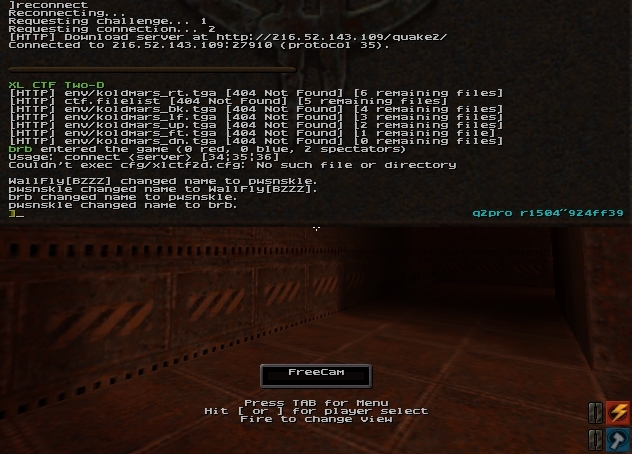 i thought maybe the problem was with the .filelist extension when i went to the web browser http://quake2server/ctf/ctf.filelist and clicked on the file the web browser would just open the text file instead of downloading it. i added a mime type for .filelist for apache2 web server.. i can now download the file in web browser... but still when connecting to quake2 server it says 404 file not found. 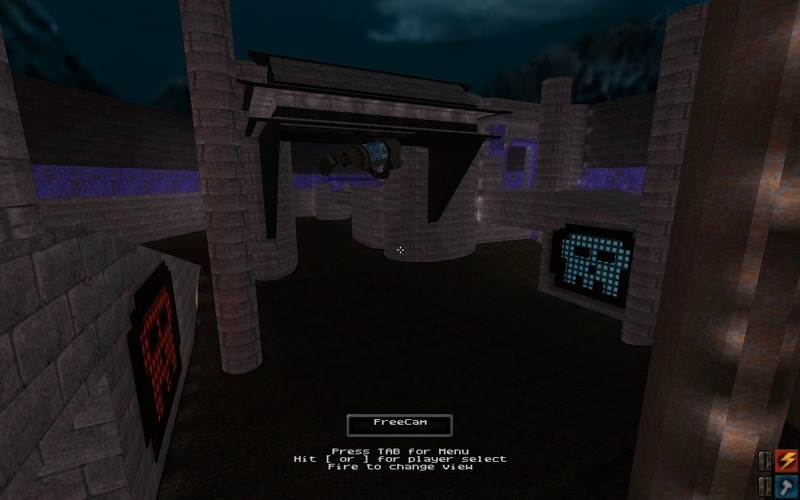 all my maps textures everything downloads fine..
http://q2.dieslow.net/quake2/ctf/ ctf.filelist file is there! Community Events / Saturday Night WAN Parties! they offer free classes from some of the top universities. these are quality classes! you can pay to get certificates to proving you actually took the course but no point in doing that unless you know for certain its going to help you get a raise or land a job. the learning how to learn class could be very beneficial to anyone from all walks of life weather you are a novice or expert theres something you can get out of it! theres no pressure or anything. i didnt spend any money or give out credit card info. can download apps on your phone or take classes on computer ether way. tons of courses in all sorts of subjects! take advantage! its never too late to learn!